Atlanta, GA: This November Atlanta is gearing up for an expansive multimedia musical experience, Shanti – A Journey of Peace, a pioneering work that bridges cultural connections through choral music, movement and visuals. Brainchild of Cincinnati based composer Kanniks Kannikeswaran, Shanti explores choral harmony and polyphonic in several Indian ragas. Kanniks describes the journey of Shanti in his interview with NRI Pulse. Describe Shanti, its concept and in your own words. Shanti is a multimedia musical experience like no other. It explores the idea of peace and interconnectedness in a very powerful way. Musically, it is an oratorio for mixed choruses, a chamber orchestra, an Indian orchestra, dancers and multimedia. It explores ancient chants for peace in a very contemporary setting. Shanti brings communities together through music. It also represents the bringing together of a musical idea by local communities coming together and breathing life into this work and creating it with a local flavor. Tell us about the origins of Shanti. Back in the 1990s had this vision of portraying the story of India on a large scale – with hundreds of singers – and with an Indian and western orchestra – and wanted this to convey the real spirit of India – ideas that have stood the test of time – ideas that are for humanity – not for one country or one culture – amazing ways of looking at ourselves and the universe – as opposed to the commercial characterization of India as a land of beggars or outsourced jobs. This story had to be told on a large canvas – with a symphony orchestra – an Indian orchestra, western and Indian singers and more – I am so grateful that this idea became a reality. This idea came true in 2004 when I completed writing the work and performed Shanti for the 1st time in Cincinnati with a cast of over 175 and audience of over 1800 (in a total of 3 shows). 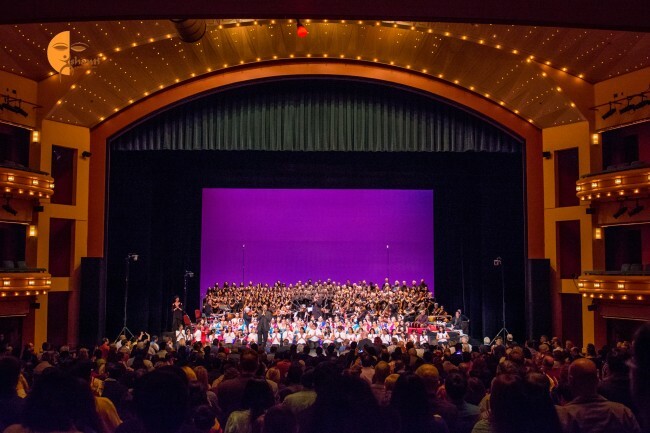 IN 2006, we were invited by the city to perform Shanti at the prestigious Aronoff center where we performed as a cast of about 250 to an audience of 2600 in one packed show. It was a mind-blowing experience. Friends of mine invited me to Allentown PA to recreate this work there. We built an Indian community choir from the scratch. western singers drove all the way from Cincinanti to Allentown to perform this work in 2006. We had a repeat performance of Shanti there in 2008. Then I had an invitation to re-create the Shanti experience in Houston, this time with 90 singers from the Houston Indian community and 90 from the UN choir – in two packed shows to a total audience of about 2800. We recently celebrated the 10th anniversary of Shanti in Cincinnati again at the ARonoff center to an audience of over 2000. Thus, Shanti has grown over the years. The music and story have stayed the same. The visuals take on a different flavor each time it is choreographed in a different city.The Atlanta performance is going to be the 10th performance of Shanti in the 10th year of Shanti..
And Shanti in Atlanta is huge; there are 90 Indian singers and 40+ western singers – 25 people in the orchestra and over 60 dancers – multimedia – visuals – story telling and more..
What does Shanti mean to you, personally? Through Shanti, we portray India in a different light – what INdia stands for – its ancient world vision of the unity of existence and the interconnectedness of all of life. I came to this country when INdia was portrayed as a land of snake charmers and beggars. I was thinking about it when I was listening to the PM in New York Yesterday.Yes, it is true. Then in the 1990s, india was perceived of as a place where our jobs went. I wanted to portray the monuments of India in their grandeur, and the world vision in a spectacular manner. This vision came true in 2004 and is recreated every time we perform Shanti in a different place. What, according you is the biggest achievement and the toughest challenge in implementing Shanti ? Shanti has altered the way in which people perceive India – I have realized it based on the feedback gotten from people. It has touched moved and inspired people. It has brought communities together. People speaking Assamese, Punjabi, Malayalam and telugu and Tamila nd Kannada and bengali and Maharashtrian and more sing together, celebrating a bond of connectedness. The western choir perceives the message of shanti and becomes one with the group. There is so much of hugging and warmth at the end of the project. Shanti has also led to the blossoming of Indian community choirs in Tampa, Fort Lauderdale, Washington Dc, Chicago, Toronto, Minneapolis – and now the Netherlands. The Greater Cincinnati Indian community choir won 2 silver medals in the World Choir Games – and one of the tarans in our repertoire is being sung by the Madras Youth Choir in Chennai! All this wouldnt have happened but for Shanti . The challenge originally was in communicating the idea – because there was nothing that could really explain the show till people actually saw it. Now there are videos! What is the ultimate goal of Shanti? Where do you see Shanti in 5 years? I would love to see Shanti performed in DC with alumni from all around the country/world – with the president and the first lady in attendance! I am working on ‘Ragas in Symphony’ to be performed in Europe; also working on some recording projects of Tamil choral music. In the work are some potential collaborations in India. I also want to document through a recording the complete collection of the Hindustani music of Swati Tirunal in the same manner that I created the first archival recording of the Indo Colonial music of Dikshitar back in 2007. Where does you love and enthusiasm for music originate from? Shanti is more than music. It is more than dance. It is more than visuals. It is about certain fundamental ideas of how we are all connected. It is about how ancient India has been a thought leader – with ideas that are so relevant to today’s world. Actually 20 years. I released my first album in 1992 – called Tiruvarangam where I set Alwar pasurangal to music – in a contemporary style. Writer Sujata was full of praise for it – he even encouraged me to come up with Part II – however the project was shelved because of lack of resources. He personally said that he was moved to tears by some of my demos. I started giving large scale performances in 1994 – with choirs, dancers, and multimedia – and realized that the crux of what I was communicating was reaching out to and touching people of non-Indian origin. Much of my work touches upon what is common to diverse groups – this emphasis of the core of commonality is what has touched moved and inspired communities.. I have taught music to hundreds of people; each choir rehearsal is a highly intense session where knowledge is exchanged; we all grow in the process. The voice is my primary instrument although I also play the violin – and the keyboards. I also work with people in fine-tuning their voices and getting prepared for recitals and competitions. I have been teaching Indian music theory and history at the College Conservatory of Music, Univ of Cincinnati since 1994. It is gratifying to see post doctoral students use what they have learned in my course in their academic careers. Why should people watch Shanti? They will experience something that they have never experienced before; they will see India as never seen before. They will hear a new sound – that of Indian and western traditional voices and a western orchestra together. They will reflect on the nature of existence, on the nature of interconnectedness of all of life – on the nature of ‘ashanti’ the opposite of shanti – and also experience sheer joy on stage and become one with the experience.